Humans are hard-wired to stay in balance. It is a built-in automatic self preservation mechanism. If you are walking and suddenly trip, without thought the brain takes control of the body and you instantly react to get back in balance. There is no choice in the matter. Balance in golf is no different. In just about every sport, your feet constantly change positions; you step, walk or run and when you move, the brain uses those opportunities to quickly adjust and balance your body. In most sports dynamic balance works for you without thought because your movement facilitates the act of balancing. This same automatic balance system usually works AGAINST you in golf. Because your feet don’t move, your brain has to make a whole different set of adjustments to stay in balance. Because your feet don’t move, the automatic balance system will adjust how the muscles work. Those adjustments make balance in golf more important than in other sports because changing muscle dynamics changes the golf swing. Golf is a unique sport because you start from a static balance position and once you start your golf swing you fall under the laws of dynamic balance. The properties of static balance and dynamic balance are different. A golfer in dynamic balance also fulfills the laws of static balance, but not the other way around. Static balance is balance over a point such as a big rock balanced and sitting on a smaller rock. As long as the big rock isn’t affected by an outside force, it doesn’t move. As soon as the big rock is moved, gravity takes over and the big rock falls. As long as you don’t fall down, you are statically balanced. Dynamic balance is balance during motion, or how humans and animals balance themselves while moving. The difference between golf and most other sports when it comes to dynamic balance (once again) is that your feet don’t change positions during the golf swing. In other sports the movement, lifting and replacing the feet gives the brain plenty of places to make the automatic balance adjustments that can’t be made during a golf swing. To demonstrate how static balance and dynamic balance work for a golfer, Imagine trying to keep your feet in one place and have someone push you enough to be off balance. You will feel your body adjust the tension in certain muscles to maintain balance, depending on how you were pushed. If you are pushed too far you will have to move one or both feet to keep from falling down. One reason humans have muscles is to counteract gravity, so if you are in balance and then you are acted on by an outside force, your muscles will make adjustments to keep you from falling. Try standing up with your knees straight and bending forward from the waist. Notice how the muscles in the back of your legs tighten up to counteract the extra weight in the front of your body. In this case you are statically balanced, but since the opposing muscles are working out of balance with each other, you are not dynamically balanced. Now try standing with your knees bent and bend forward. Your backside should move back to counter your forward bend. In this case your body is using weight to counter weight and opposing muscle groups are working evenly with each other. In this case you are both statically and dynamically balanced. This is the preferred balance method the body will use provided you allow it. The difference between the two exercises was the straight knees vs. the bent knees. When you straighten your knees, you tighten the muscles in the front of your legs. The opposing muscles in the back of your legs are free to counter the muscles in the front of your legs up to a point. Because the locked knees force certain muscles of your legs to work harder than their opposing muscles, you are dynamically unbalanced. In the bent knee exercise, you are using the front and back muscles together, so when you bend, they act evenly to counter the weight. The second exercise demonstrates dynamic balance at work. Dynamic balance is the balancing of opposing muscle groups in the body during movement as a reaction to gravity. If you start your golf swing from a position that is not BOTH statically and dynamically balanced, your brain will immediately start making unplanned adjustments to your muscles in an attempt to regain a state of dynamic balance in response to the brain’s auto-balance mechanism. When the brain attempts to rebalance your body during your golf swing, the muscles you intend to use to hit the golf ball are now reassigned to balance, which changes the course of your golf swing. This subtle act of trying to achieve dynamic balance happens without your awareness and is the most common reason for 90% of all technical golf swing problems. There is no stopping dynamic balance, so as a golfer you must work with it. Think about what happens when your balance is a little off and your shots aren’t going where you intend them to go. In your mind, you start wondering if something is wrong with your golf swing. Being out of balance during the golf swing is the biggest reason golfers start thinking technical swing thoughts during a round of golf. IMPORTANT: These balance issues CANNOT be fixed with technical golf instruction. This is also the core reason technical golf instruction doesn’t last. You can use all of the different golf swing styles you want; if your body isn’t in balance during your golf swing, your brain will try to adjust the muscles of your body to get back into balance, which will alter any golf swing. This is also why the setup routine I created took so long to develop and why doing it properly eliminates so many swing errors. I had to find a foolproof stance routine that is both statically and dynamically balanced. Once you are in balance, you will find one more huge benefit. 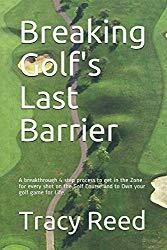 I discovered it when I created Golf Swing Control, but didn’t realize how important it was for golfers until I developed Bio-Visual Focus for advanced golfers. Balance awareness opens the door to access your subconscious mind, which is the door to the Zone. When I started getting emails from Golf Swing Control members telling me that they were seeing their own golf swing moving in their mind during their golf swing, I knew there was more to balance awareness than I had figured. Many described their visuals as if they were watching their own body from the inside out. It sounded a little weird, but I had experienced the same thing. Looking further into this phenomenon, I realized that any access to the subconscious gets blocked if the subconscious mind is busy trying to place you back into dynamic balance. This is why the Zone is so difficult to get into. On the other hand, if you are moving in dynamic balance, the mind prefers visualization over conscious thought and the subconscious (the Zone) is available. This phenomenon explains why even PGA tour golfers sometimes struggle during play. When they are playing slightly out of balance, the shots don’t go as planned and visualization is difficult. This often leads to technical golf swing thoughts in an effort to right the ship. The result is a tough day grinding it out on the golf course. I always address balance awareness first with every student I teach. I find that fixing balance also repairs many of the other mistakes that golfers make, which makes adjusting the rest of the golf swing easy. Understanding balance helps you understand the full importance of getting each detail of the setup routine in this book right and makes your improvement happen very quickly. Agree completely but have an important question — how can one practice dynamic balance with deep practice? If you monitor your weight/balance and control the weight so that it is proper, the swing works. Make balance a priority and the swing will follow.